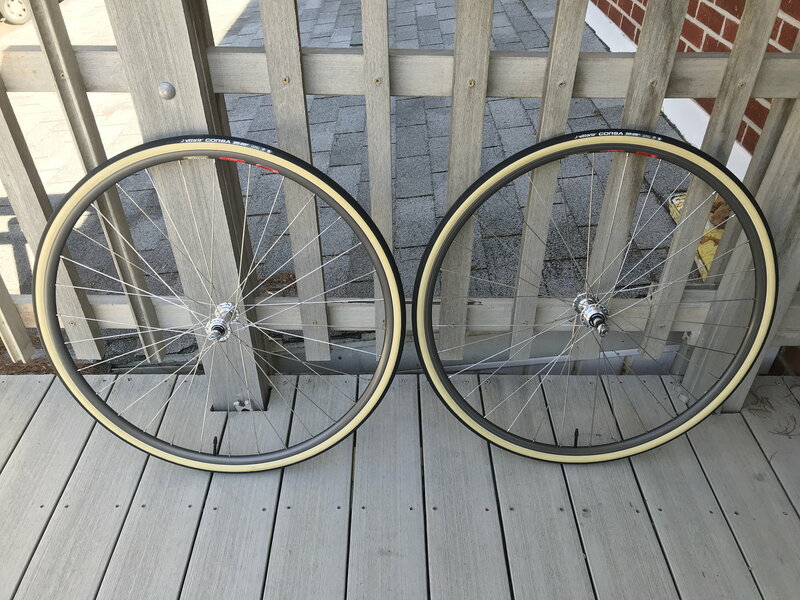 Finished overhauling a tubular wheelset for a pal except for the truing. They're Legnano branded Ofmega high flange hubs on Fiamme rims. Used a couple stacks of cd jewel cases on the kitchen counter to check the dish. Driving to pick up n+1. a trek for a Trek? Clearing junk and shuffling stuff around the shop, so I can get 4 more bikes hung from the ceiling. Goal is to have one bike by the door ready to roll and a 12'x8' clear space kept open for getting things done efficiently. IE: enough room to walk around a bike on a stand. Painting my new to me Bianchi inbetween rain days , still need to go a few more coats and then clear coat . finished building a set of wheels to complete my Miyata Pro Suntour Superbe bike. Superbe low flange 36h hubs with DT champion spokes and polished araya red label rims. unfortunately the weather has turned on us again and will have to wait for the snow to clear before taking it on a ride. Last night, I volunteered at the bike coop. I had to troubleshoot some difficult problems for two customers. 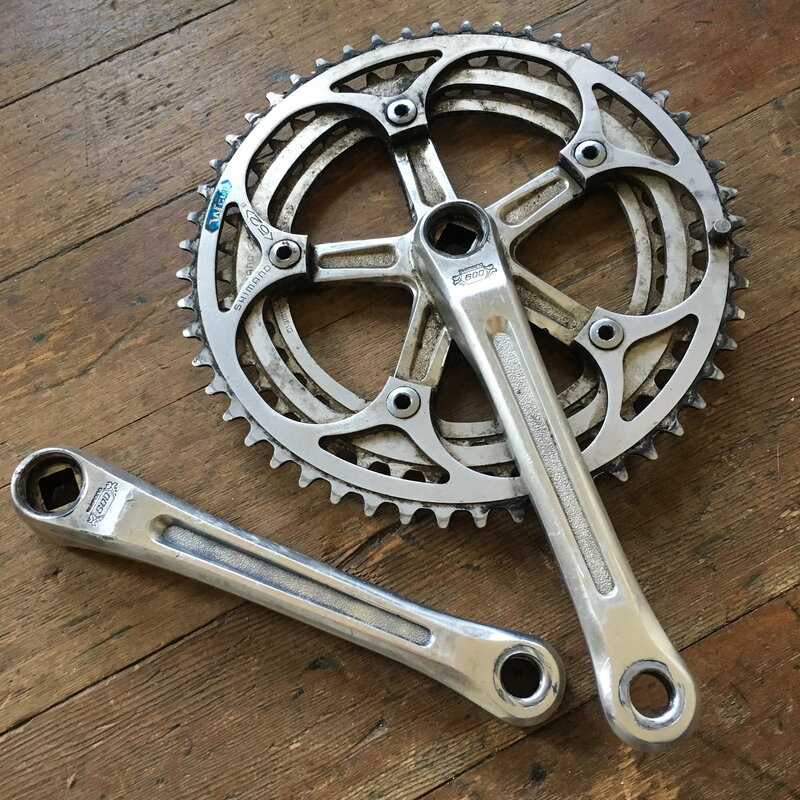 One had a triple crankset and brifters and a very worn chain. Her chainrings are also very wobbly, probably from a side collision. I think we got it going right. She did the final test ride and said it was OK. The other had just had a new rear wheel installed on his folding bike. 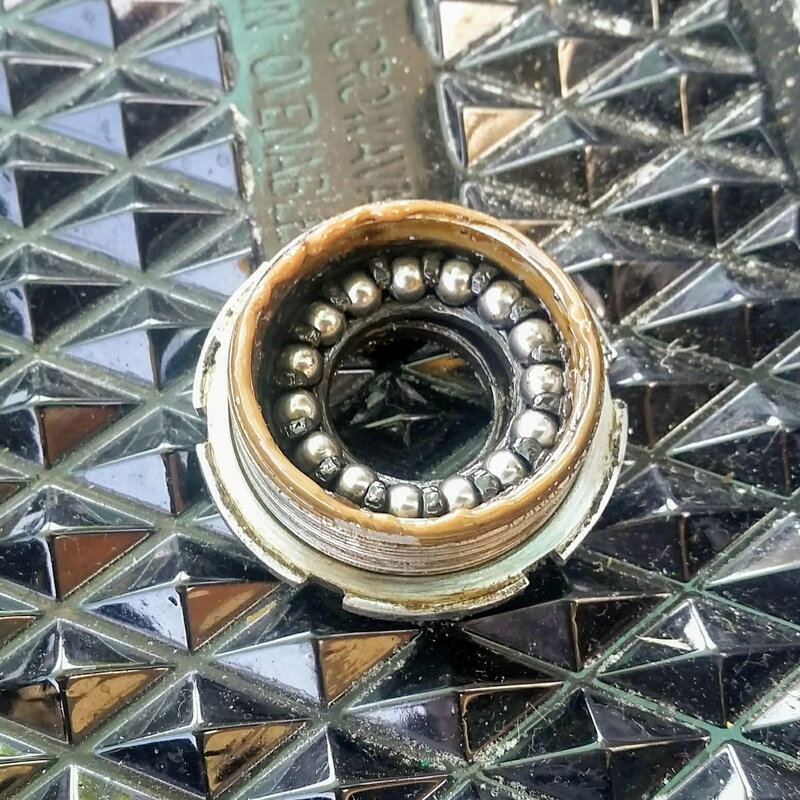 He previously had an 8-speed cassette hub. 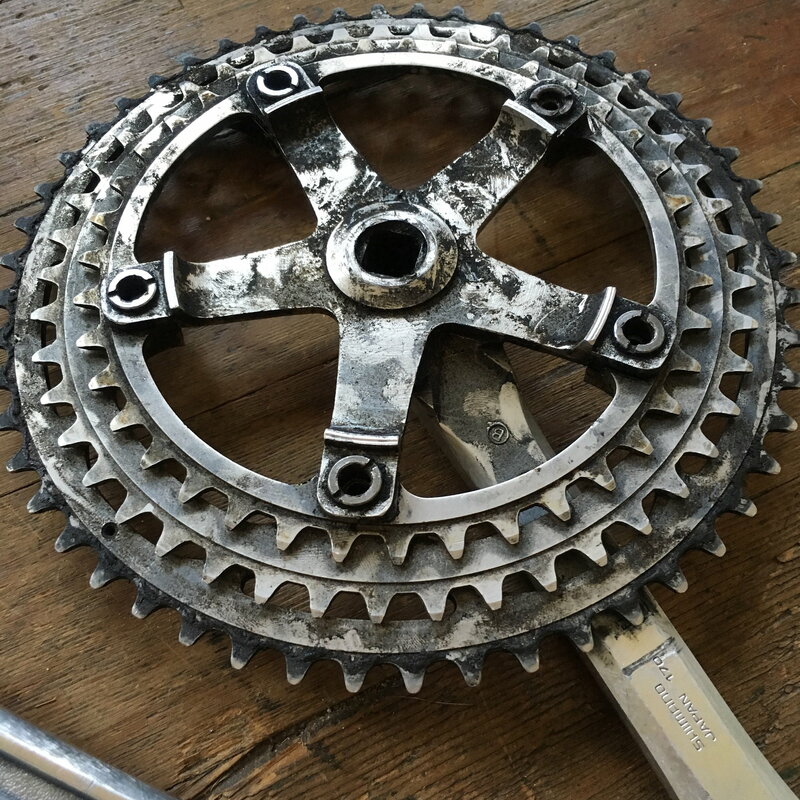 Now he has a Sturmey Archer 3-speed hub with 8-speed cassette. When he shifted the 3-speed, he didn't feel the difference in gear ratio. The problem was two-fold. One was that he's not sensitive enough to gear changes so when it worked, he didn't notice. The other was that the cable stop was poorly bolted onto the frame, and there was no obvious fix. He's going to bring the bike back to the guy who installed the new wheel. Both problems took a long time to work on because at the coop, we try to teach without touching the bikes. We want to impart information more than fix bikes, and we know that people learn better with their fingers than with their eyes. I could have accomplished so much more in that time if I had been working on the bikes alone, but that's the deal. The woman was extremely grateful for all she learned. The man was less so, and I learned that he's a hard-to-satisfy customer, and that's his right, too. Trying very hard NOT to put primer and paint on an old Bob Jackson and hold out for powder. I have told myself if I happen to find premixed paint in the right orange It was going to get wet. I have gone as far as taping off all the chrome but that is it. -Talked with my plater about anodizing some parts. -Stopped by my favorite LBS and had some wheels trued. They didn't need much of anything, so there was no charge. -Bought a can of Vittoria tubular glue from said LBS. Received a package in the mail, amd promptly proceeded to mount them on the rims to stretch them. Gluing will happen next week. 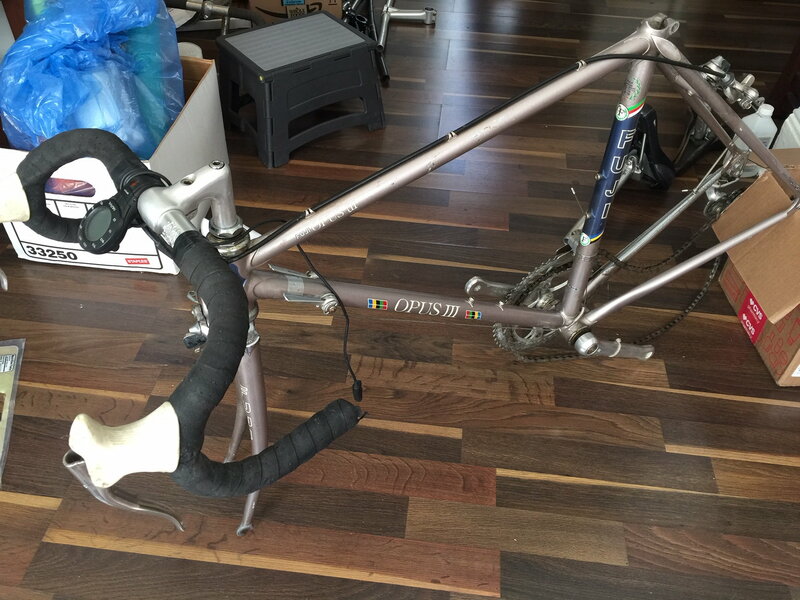 Just unpacked this 1986 Fuji Opus III that arrived this morning and am ready to do a test ride before breaking it down for a proper clean-up! Rode my falcon to gf's job because she forgot her meds. 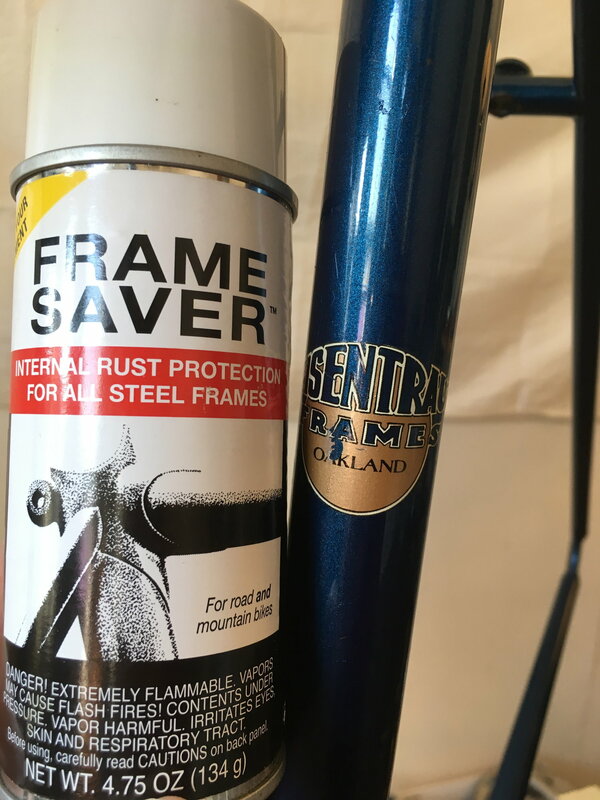 A few days ago, preparing to install a headset, I cleaned the interior of the headtube with a very light sanding. The cups installed nicely. The steerer however? Well I mistakenly gave the crown race seat similar treatment. Though it was the lightest sanding, it was mostly bare metal when I was through. The race installed without side play, but it spun easily by hand. Waiting for parts: bars and stem from ebay and replacement for a faulty campag BB. 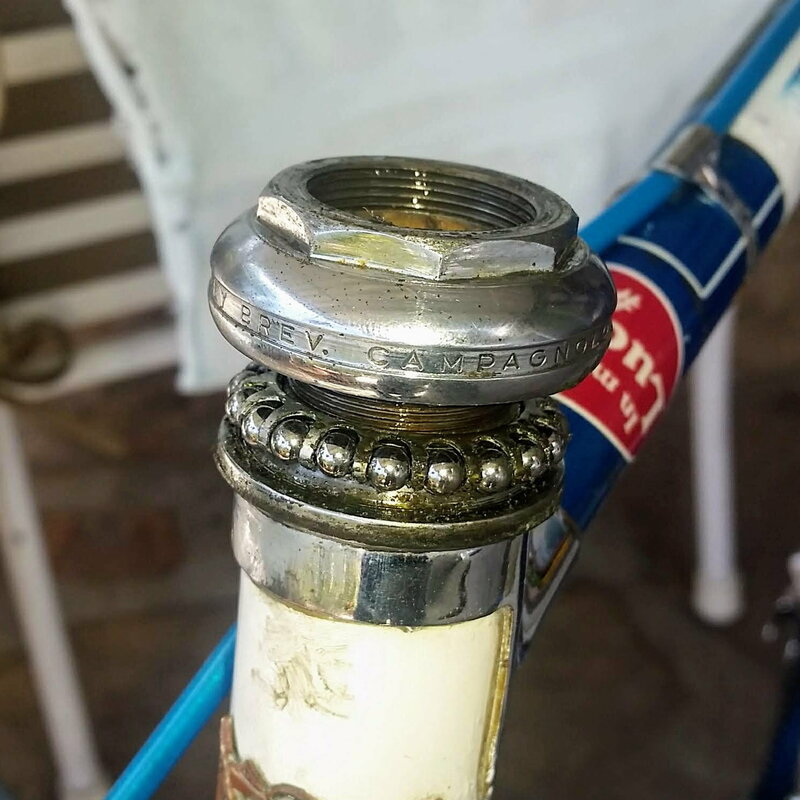 After 55 years, I decided it was (PAST) time to service the headset and bottom bracket on my '64 Legnano, had since new. 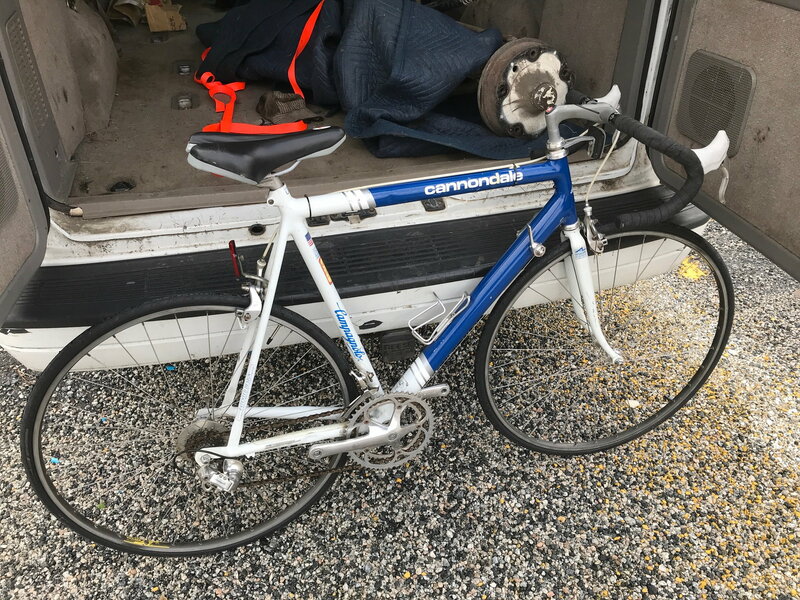 I've done a few newer bikes, but the old Legnano has been my faithful and much neglected partner on many adventures all these years. 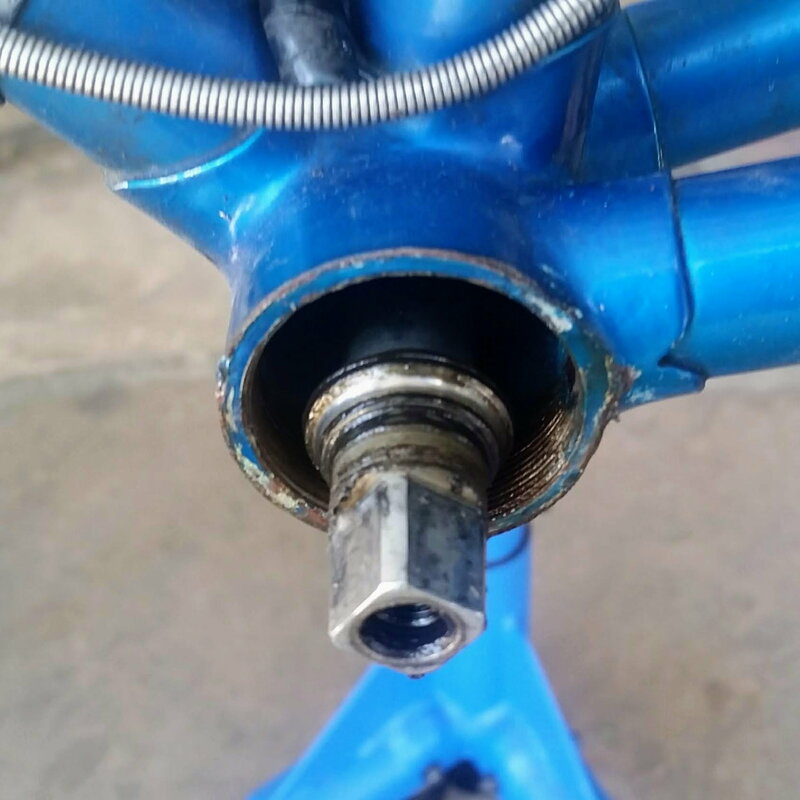 The crank still spins freely and never felt a problem with the headset. Still 55 years is a long time. 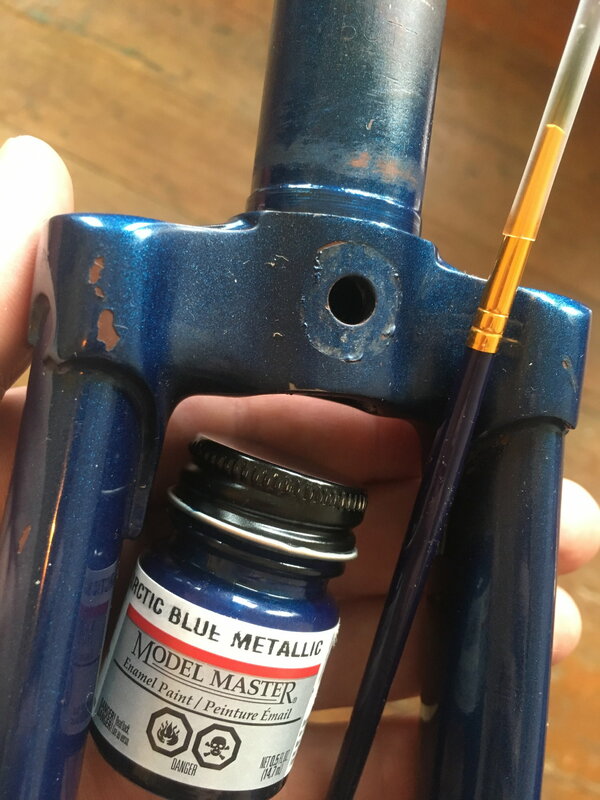 Got it apart, the grease was almost non-existant, replaced by a filmy hard sludge somewhere between grease and hard epoxy. I had to scrape it off the cups, after soaking everything. These old bikes are tough. 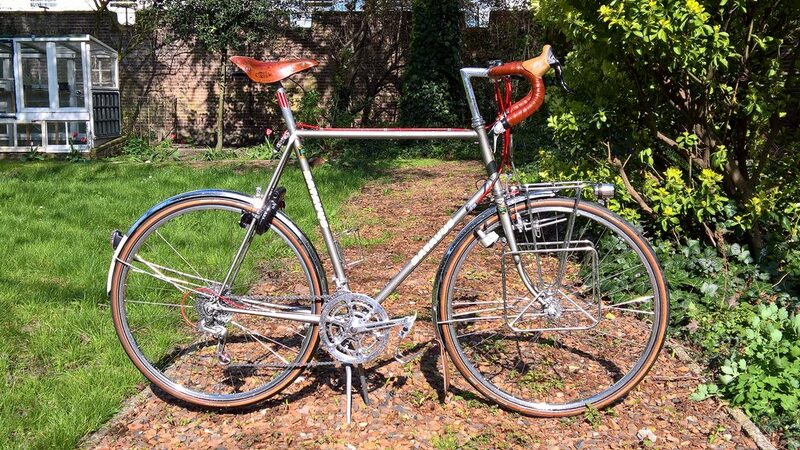 Hope to get it together tomorrow, in time for a couple of rides before next week's Eroica. 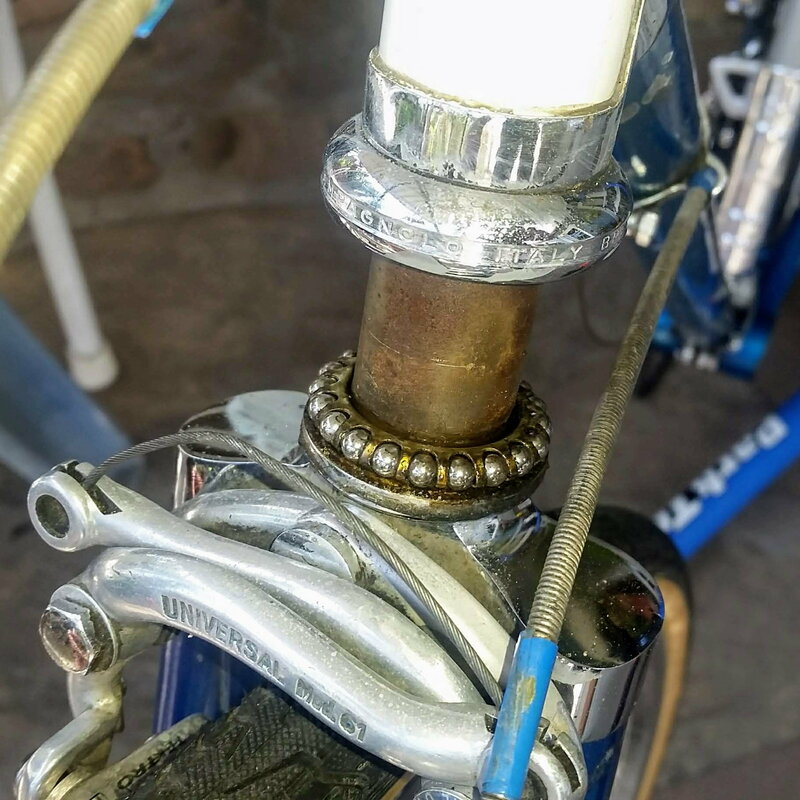 It did fine on the 2016 Eroica with 52 year old grease, so 2019 should be even better with new grease and balls! The sun was out, so bike cleaning time! Anyhow, some cleaning to do before the day is done! Either Arabesque has some truly unusual design parameters, or those chainrings are all stacked on the wrong side of the arms....and the big one is incorrectly clocked. They’re all just loosely stacked together on the outside. To keep ‘em together I suppose. There’s no way it was used as such. I'm prepping bikes to sell as a part of a larger effort to reduce the fleet size. It of course will not be without its "stair steps" down via building or perhaps acquiring other bikes to sell or keep, but the goal is three plus a rain bike....plus a track bike when it very eventually gets built up. The three "keeper" bikes are fully built and/or modified to permanent status. 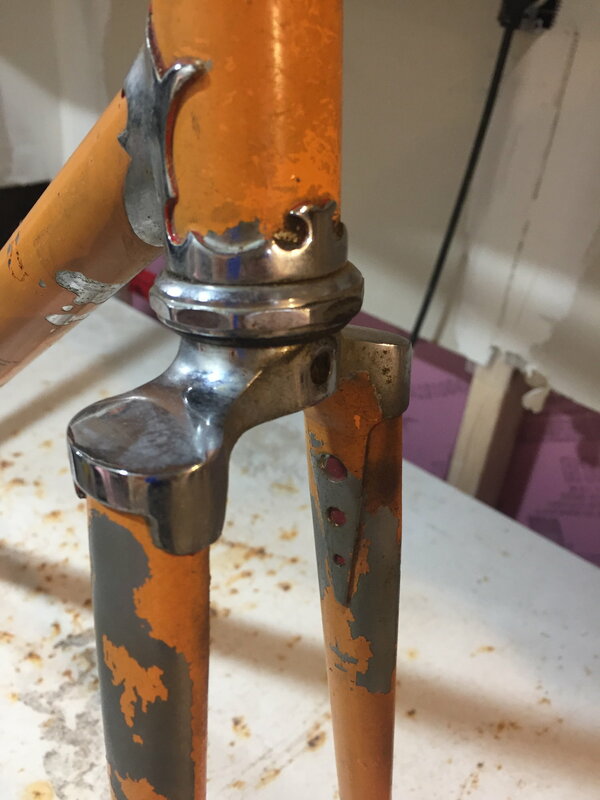 The rest of my work is selling either vintage parts or building up complete bikes--vintage frames with more modern parts--to sell to very happy tall riders as that market is continually underserved. I run my tall bike orphanage with tons of love and effort, carefully sending new bikes out when they are fully realized. I am sad, but happy at the same time. This weakend was the "official end of winter/start of spring". I serviced then stored the snow thrower and, thus, freed the tractor from winter servitude. I then washed and lubed the two winter bikes: Babe the Blue Oxen and the Ersatz Gran Prix. Down from the loft came the Raleigh, Nishiki, Crescent and Voyageur from their long winters nap. Up went Babe and the Ersatz. They've been pretty cold since New Years and deserve a nice long nap in the warm loft. Poor things. Sunday afternoon I rode my drop bar conversion on the Thun trail, in shorts and a t-shirt! Huzzah!!! Going to pick up my newly powder coated Ochsner steel frame and fork. WOO HOO!